Some thirty years ago, I went into sermons from the early third century into the nineteenth century dealing with this story of the Samaritan, and I found out that most preachers, when they comment on that passage, comment on it in order to show how we ought to behave towards our neighbor, when in fact this is the opposite of what Jesus, who tells that story of the Samaritan, wanted to point out. The Pharisees came to ask Him, “Master, Teacher, tell us who is my neighbor?” They didn’t ask him, how does one behave to one’s neighbor? They asked him, point blank, the question: Who is the guy whom you call neighbor? There is no way of categorizing who my neighbor ought to be. [...] The Master told them who your neighbor is is not determined by your birth, by your condition, by the language which you speak, by the ethnos, which means really the mode of walking which has become proper to you, but by you. You can recognize the other (hu)man who is out of bounds culturally, who is foreign linguistically, who – you can say by providence or by pure chance – is the one who lies somewhere along your road in the grass and create the supreme form of relatedness which is not given by creation but created by you. Ivan Ilich was a Croatian-Austrian philosopher and Roman Catholic priest. Excerpted from here. 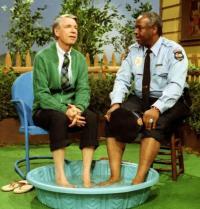 The photo is Mister Rogers and Francois Clemmons -- background story here. Seed questions for reflection: How do you relate to the notion that your neighbor is someone you decide, not someone you have to choose? Can you share a personal story of a time you created a sacred form of relatedness with someone else? What helps you go beyond the limits of your conditioning to truly create relatedness with another? Here's my take on this text as a preacher: Jesus was saying "Your neighbor is the person you least want to be 'beholden to'." That's a colloquialism from my youth growing up in Appalachian USA. So I totally agree with Ivan Ilich! I've not felt like I had to chooose which one I'd want for a neighbor. I do know my heart will tell me who my neighbor or is though. 'My neighbor is someone I decide' means to me that my neighbor is someone I decide to relate to with true care and in a way that helps him or her have what is needed to heal and/or grow. There have been times that I have listened carefully, responded in a way that was respectful, responded in a way that the other felt safe, responded in a way that connected with the othier, provided what was needed, and the other benefitted. Such times were sacred forms of relatedness with the other. What helps me create relatedness with another is to truly be present with the other and listen to and respond to what the other is presenting, not to my tlhinking, prejudices, expectations, agendas, or judgments, which allows intimate healing sacred relatedness. Ivan Ilich offers a different way of knowing who is our neighbor and I love it. Relating to some one, a stranger, even an enemy, without preconceived and conditioned notions about who is my neighbor is the right way of creating sacred relatedness. Such relationship is created by turning in, by seeing with clear eyes and by listening to the inner voice, the voice of the heart. As Ivan Ilich states, "There is no way of categorizing who my neighbor ought to be" and my neighbor,"whom I decide to, not whom I have to choose." I came to America in 1959 at the age of 34 to study at the University of Chicago, a strange city in a strange country with no friends and friendly neighbors and very cold freezing cimate. I was going through mild depression. There was another student from Poland staying in the same building on the second floor. As I was going out to go to school on a very cold morning, he noticed me with compassionate eyes. He faced me and extended his emotionally warm hands. He touched my hands and said,"Consider me your brother!" His touch and words removed the fog of my depression. He was 7 feet tall,I am 5 and a half feet tall. He was all white. I am all brown. He was Catholic. I am a Hindu. He was from Poland. I am from India. All these outer barriers vanished, He became my good Samaritan neighbor. He has passed away. He dwells in my heart. What has helped me to go beyond my conditioning to create a sacred form of relationship is an ongoing awareness of the walls and boundaries I create in my own mind. This way of relating myself to myself with awareness and releasing my inner boundaries helps me to relate to others in an open and free way.. It goes beyond my self- created boundaries caused by conditioning and ignorance. This is an ongoing promising journey. May we cultivate an attitude of relating to a stranger with awareness, with an open mind and an open heart!